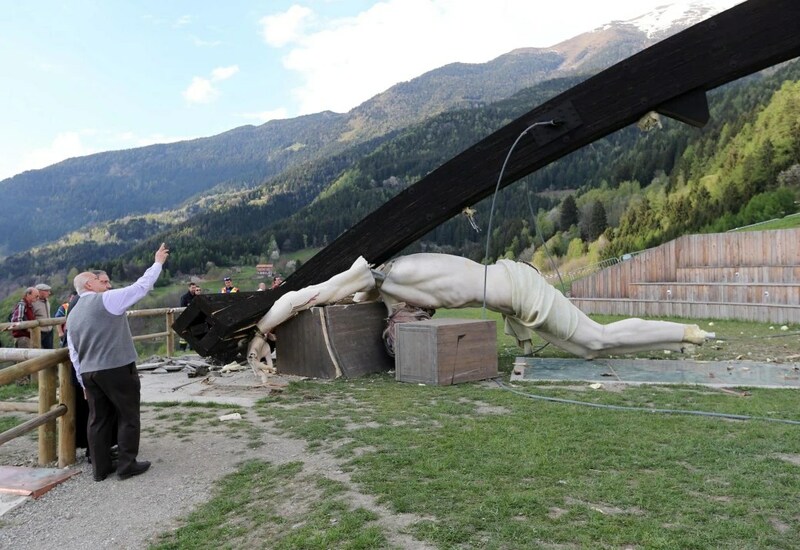 A man was crushed to death when a giant crucifix dedicated to Pope John Paul II collapsed and fell on him, ITV News reports. The accident came just days before a historic canonization that will see the late pope declared a saint. The 98-foot-high wooden and concrete cross fell during a ceremony in the Italian Alpine village of Cevo on Thursday, killing 21-year-old student Marco Gusmini. Another man was taken to hospital. The structure was dedicated to John Paul II on his visit to the region in 1998. Obama represents the worst of rogue leadership. He’s a war criminal multiple times over. He threatens world peace. On Wednesday, he arrived in Tokyo. It’s the first leg of his Asian tour. South Korea, Malaysia and the Philippines follow. Much more than a territorial dispute is at stake. Regional tensions could erupt into something much more serious. Washington wants Russia and China contained. It wants them isolated, weakened and co-opted. It wants them transformed into US-controlled vassal states. Great conflicts begin this way. Obama warned Russia. Sanctions are “teed up and ready to go,” he said. Expect them “in days, not weeks,” he added. He lied saying Moscow isn’t “abiding by the spirit or letter” of Geneva four-party agreement terms. “The fact I haven’t announced them yet, doesn’t mean they aren’t” ready to be implemented. “Were talking about illegally occupied buildings in eastern Ukraine where the legitimate government is taking steps to ensure there’s law and order, versus tens of thousands of troops in a threatening position on the border of the country,” she said. Russia’s comments don’t suggest it plans implementing four-party Geneva agreement terms, she added. New sanctions are expected to target high-level Kremlin officials as well as entities they oversea. Others on key Russian industries may follow depending on events as they unfold. Putin responded to Obama’s threats. He did so from a St. Petersburg media forum. Sanctions “are absolutely not critical in nature, but you can’t of course say they are a good thing,” he said. Russia isn’t planning to punish Visa and Mastercard, he added. “We are not envisioning any steps to punish the careless partners, but they have undermined their credibility, meaning they will definitely lose the market,” he said. Imposing them cuts both ways. Other EU countries expressed concerns. Washington bullies them to go along. “An all-arms operation has been launched in Slovyansk. This means just one thing – a civil war.” Acting Mayor Vyacheslav Ponomarev warned residents to stay home. He said local police and self-defense forces are ready to counter military attacks. “There will undoubtedly be resistance. We are restraining” Kiev forces. “Volunteers – even unarmed – continue to arrive at the strategic post.” Reports suggested Ukrainian forces pulled back. They massed from a more distant point. Police and self-defense forces swept a nearby forest area. They looked for Right Sector thugs and other hostile elements. In response to crisis conditions, Russia ordered new military exercises. They’re planned for regions bordering Ukraine. “We are compelled to react to (the) situation,” said Defense Minister Sergei Shoigu. Drills involve ground and air exercises, he added. They in response to 11,000 Ukrainian soldiers, 160 tanks, 230 armored vehicles, and at least 150 artillery pieces, he said. Self-defense forces are way outnumbered and outgunned, Shoigu explained. Ukrainian sabotage units were deployed near Russia’s border, he added. Things seem headed from bad to worse. Lives of Russian nationals are threatened. Lavrov said they won’t be left unprotected. Targeting them is attacking the Russian Federation, he said. US paratroops arrived in Poland. They’re the first ones in Eastern Europe since Ukrainian crisis conditions erupted. They’re Vicenza-based 173rd Infantry Brigade Combat Team members. They arrived a day after the Pentagon announced plans to deploy 600 US forces to Poland, Latvia, Estonia and Lithuania. Pentagon spokesman Rear Admiral John Kirby said they’re part of a series of rotational deployments. They’ll continue throughout 2014. Perhaps into 2015. “Russia’s aggression in Ukraine has renewed our resolve to strengthening NATO’s defense plans and capabilities, and to demonstrate our continued commitment to collective defense in reinforcing our NATO allies in central and eastern Europe,” he said. “We hope this is one of the many steps to enhance the security of Poland and central Europe,” he added. Irresponsible Russia bashing continues. Big Lies repeat with disturbing regularity. Media scoundrels regurgitate them. Days earlier, The New York Times lied about so-called “mysteriously well-armed, professional” Eastern Ukrainian masked gunmen. The Times was caught red-handed lying. It unsuccessfully tried buying the story. It did so well into a follow-up report. Downplaying Big Lies doesn’t mitigate them. It wasn’t the first time its bogus reports were exposed. For sure it won’t be the last. Daily Times Russia bashing continues. Shameless misinformation substitutes for legitimate journalism. Readers are consistently lied to. So-called fit to read news is garbage. So-called Russian threats don’t exist. Claiming otherwise turns truth on its head. So is saying “Moscow’s muscular intervention in neighboring Ukraine” threatens its neighbors. Don’t expect Times correspondents, commentators or editors to explain. Wall Street Journal editors bash Russia relentlessly. On April 24, they headlined “Putin and Navalny.” More on what they said below. Putin challenges Obama’s imperial adventurism responsibly. Navalny is a convicted embezzler. He masquerades as an anti-corruption crusader. He’s a Western darling. He’s a convenient stooge. He’s no democrat. He’s ideologically over-the-top. He gets generous State Department funding. Don’t expect Journal editors to explain. They lied claiming he was convicted on “trumped-up corruption charges.” He was caught red-handed. He’s under house arrest. He awaits trial on other grand theft charges. He “warned for years that an authoritarian Putin would eventually become a threat to the West, but they were dismissed by Westerners who said it was none of our business,” said Journal editors. Truth is polar opposite duplicitous Journal editor claims. Fact: Russian democracy under Putin shames America’s sham version. Fact: Putin respects rule of law principles. Fact: Obama consistently violates them. Fact: Putin goes all-out for peaceful conflict resolution. Fact: Obama wages one war of aggression after another. Journal editors reported other Big Lies. “Iran is attempting to (develop) nuclear weapons,” they claimed. Clear evidence shows otherwise. It’s “pressing” what it considers its legitimate rights. He’s the one world leader above all others challenging Washington’s imperial rampaging responsibly. Sino/Russian cooperation has the best chance to contain it.